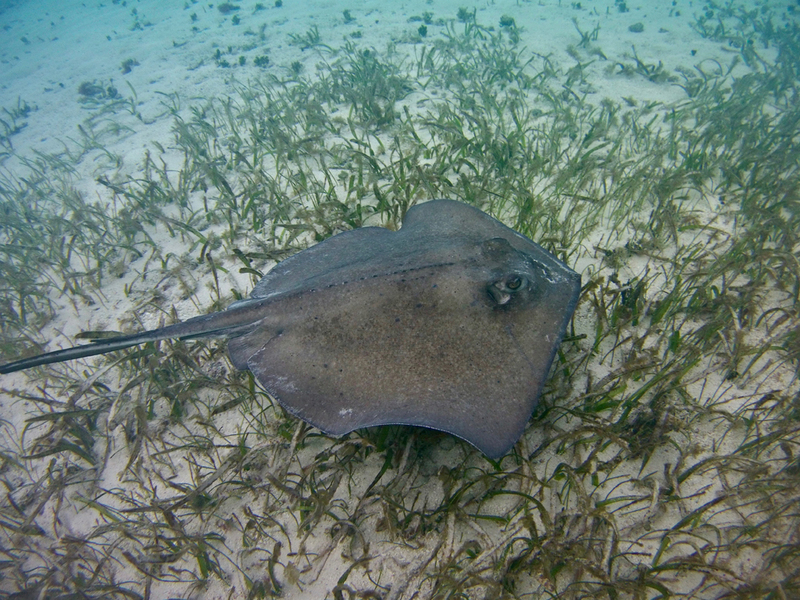 A southern stingray is spotted in South Water Caye in Belize. The government of Belize today announced the establishment of the first-ever nationwide ray sanctuary, motivated, in part, by data from Global FinPrint scientists at FIU. Globally, rays are threatened with extinction due largely to overfishing, habitat loss and climate change. They are even more at risk than sharks. More than 20 species of rays are known to populate the waters along Belize. As part of Global FinPrint, FIU researchers have deployed baited remote underwater videos (BRUVs) to monitor the abundance and distribution of sharks and rays, hoping to fill critical data gaps and guide conservation strategies throughout the world. While combing through hundreds of hours of video footage to inform Belize’s National Plan of Action for sharks, scientists found thriving populations of rays. Global FinPrint researcher and FIU Ph.D. student Kathryn Flowers shared the find with officials from the Belize Fisheries Department. Although there are shark sanctuaries in some parts of the world, only a couple include rays, and prior to the Belize announcement, none were specifically for rays. Belize is home to the world’s second largest barrier reef with a diversity of rays ranging from tiny yellow round rays to large manta rays. The critically endangered smalltooth sawfish and endangered Ticon cownose ray are also believed to be in Belize waters. Global FinPrint is a three-year survey of reef sharks and rays throughout the world and is led by researchers from FIU in collaboration with Australia’s James Cook University, Curtin University and the Australian Institute of Marine Science, as well as Canada’s Dalhousie University. The project has received core funding from philanthropist Paul G. Allen and is one of several ocean health initiatives within the Microsoft co-founder’s portfolio. FIU scientists have become increasingly concerned about the vulnerable populations of sharks and rays around the world and especially in Belize, where Global FinPrint lead scientist and FIU professor Demian Chapman has worked for nearly two decades on shark conservation. Earthwatch Institute, the Roe Foundation, and the Mays Family Foundation have also contributed to these research programs.